I must actually be an optimist, because no matter how many times I've been rained on in general admission at outdoor shows, I still buy lawn tickets. An optimist or a cheapskate. Won't it be nice to picnic on the grass with friends, I think, as I click "purchase." All other occasions when I've sat huddled under a garbage bag to keep out the rain have disappeared from my mind. Even on Sunday when I was getting ready for the Sweetlife Festival, I looked at the weather and saw a 20% chance of rain. Yay, it won't rain, I decided, specifically choosing to bypass umbrellas. 20% equals 0% for me. Thankfully, Joe convinced me to bring a raincoat. But even though of course it rained, a steady drizzle that turned into bona ride miserable storm the festival was still fun. Towards the end, the rain disappeared so the crowd could thoroughly enjoy Lupe Fiasco, Girl Talk and The Strokes. The first two of those acts got panned in the Post, but out in the muddy lawn seats, everyone seemed to be having fun. That's all Girl Talk is about, having fun. Dancing like a maniac with thousands of people doing the same. 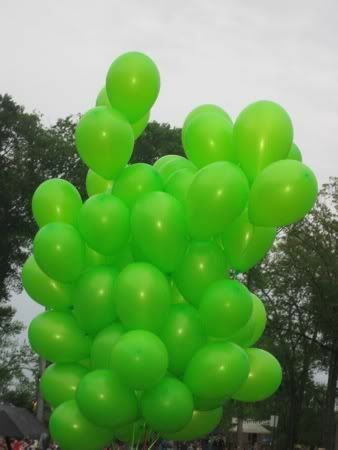 Also confetti and balloons. There's nothing deeper to it than that. Music purists may be appalled by Girl Talk - 30 second clips of music strung together for the ADD generation. Why listen to an entire concert of one artist when you can listen to the best of 60 artists' work crammed into one hour? I argue that Girl Talk doesn't equal the apocalypse for pop music. I watched the same crowd get just as jazzed for The Strokes and they are about as classic rock and roll as you'll get in 2011. The two can sit together, in harmony, on the same festival lineup. 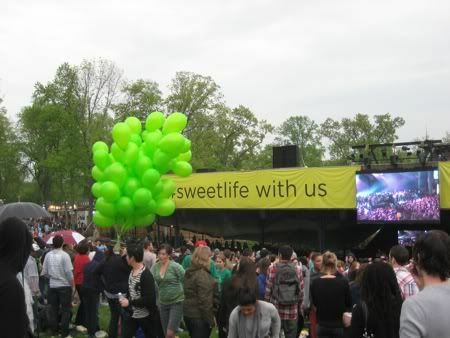 Posted in DC, Music and tagged with Sweetlife Festival, Concerts. May 2, 2011 by Adele Chapin.